One of the things I love about Korea is the sense of community built around food and the interactivity that happens right at the dinner table. Many meals are “family style” where dishes are shared and cooked on your tabletop. 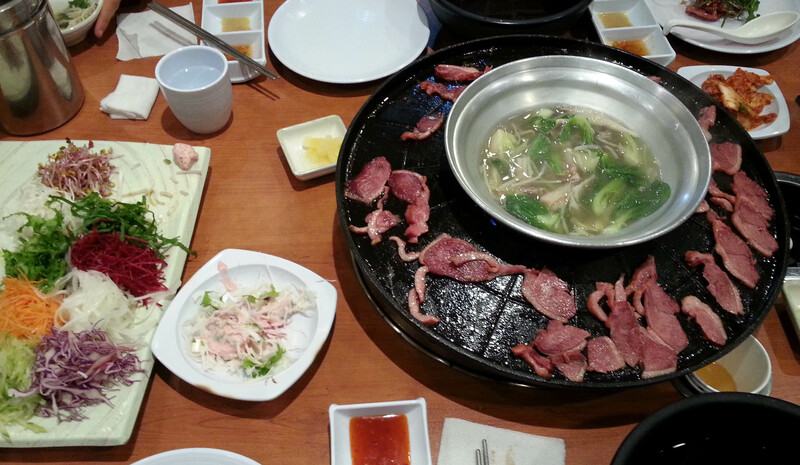 Korean barbecue is one of those meals and one that I never get tired of. 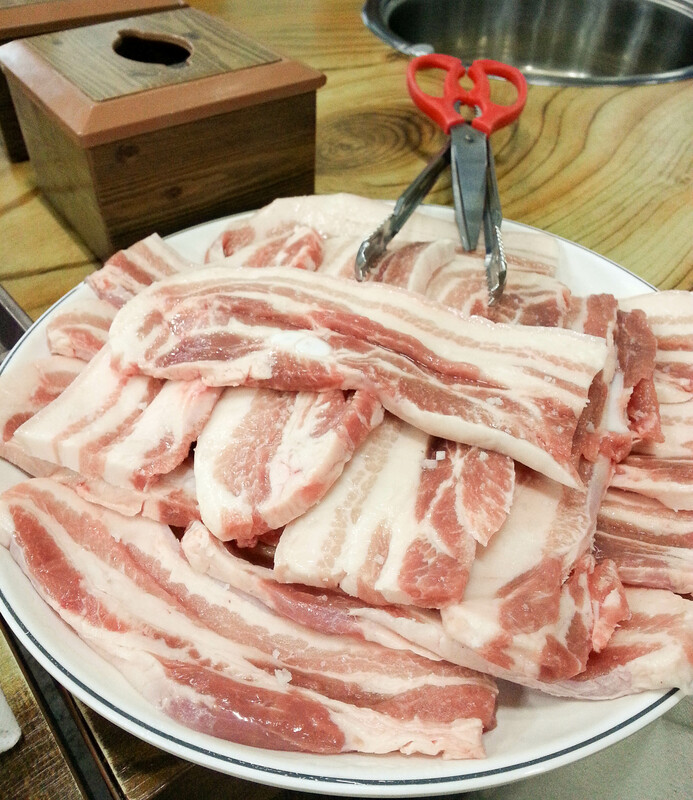 Samgyeopsal, which is pork belly, is the quintessential cut of meat for Korean barbecue. It’s ordered by the gram, usually 100-200 per person, and is brought to your table raw, unseasoned and un-marinated. That may sound a bit boring, but once it starts sizzling on the gas or charcoal grill built into your table, you won’t be disappointed. 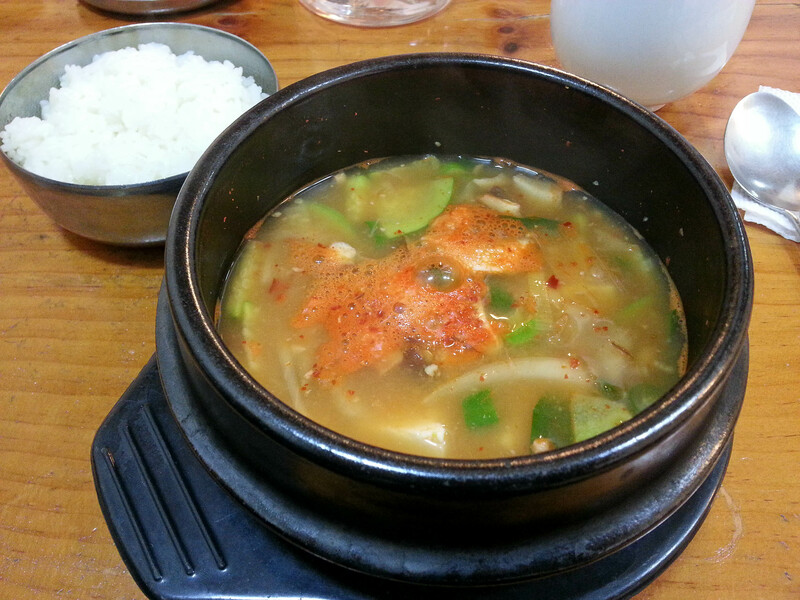 Samgyeopsal is always served with ssamjang (a thick dipping sauce made with red pepper paste and fermented soybean paste) and either a little bowl of course salt or a sesame oil and salt combination. Once the pork is nice and crispy on the outside, I like to dip it in the two and wrap it up in a lettuce or perilla leaf which are also always served with samgyeopsal. I also like to add garlic, cloves of which are grilled at your table alongside the pork. 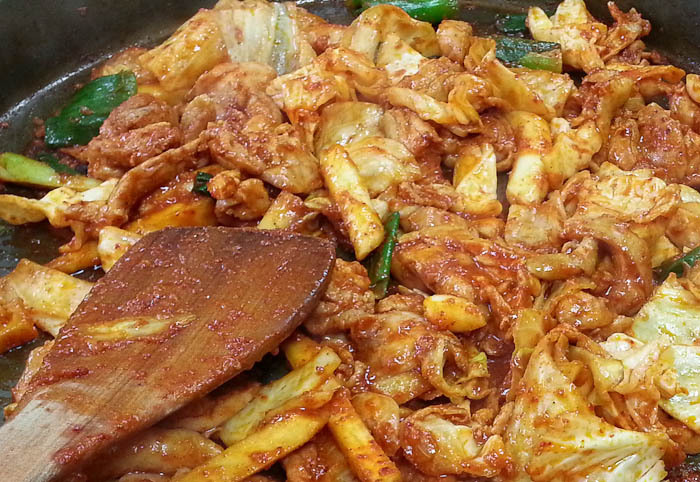 Sometimes grilled kimchi is a nice addition as well. 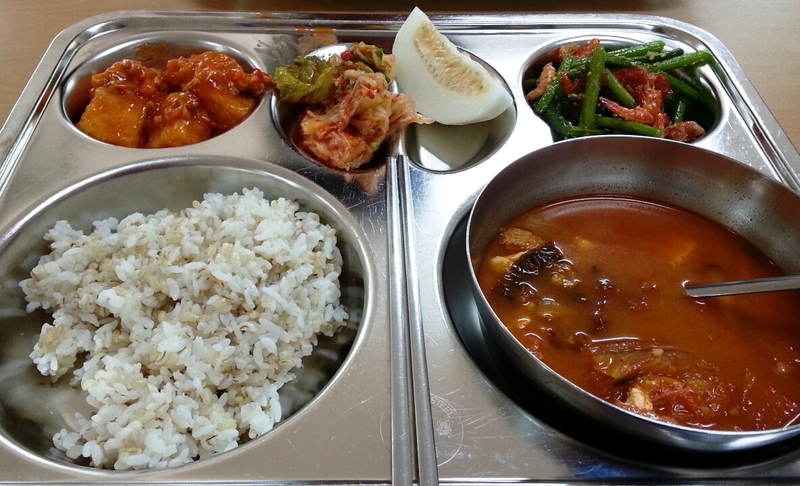 Like all Korean meals, an array of banchan (side dishes) will be brought to your table along with the samgyeopsal, kimchi, garlic and lettuce. 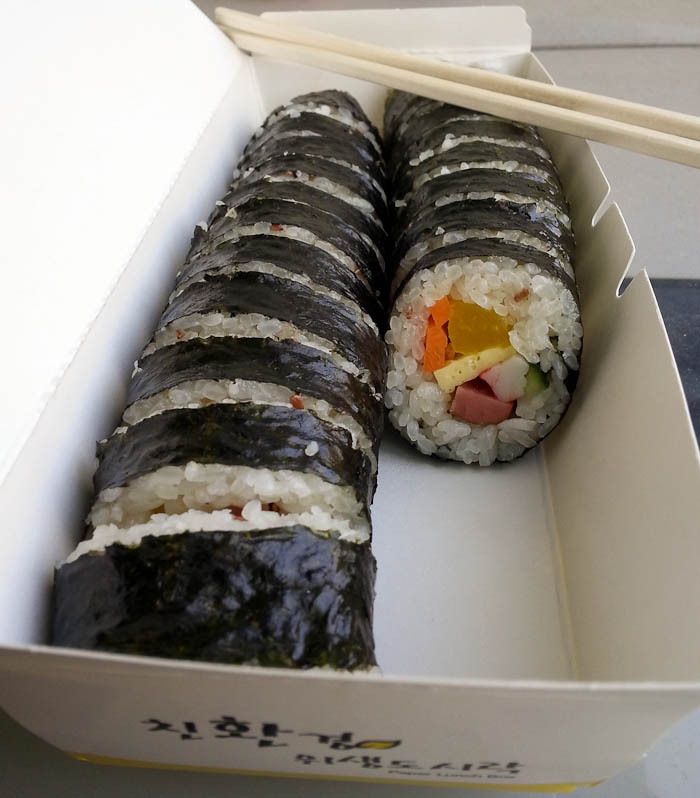 Typically you’ll get a soup, pickled radish, onions, mushrooms, bean sprouts, and some marinated seaweed, among other things. It varies from place to place, but they’re always free with your meal and refillable at no extra cost. Usually one person in your dinner party takes charge of the grill at your table. 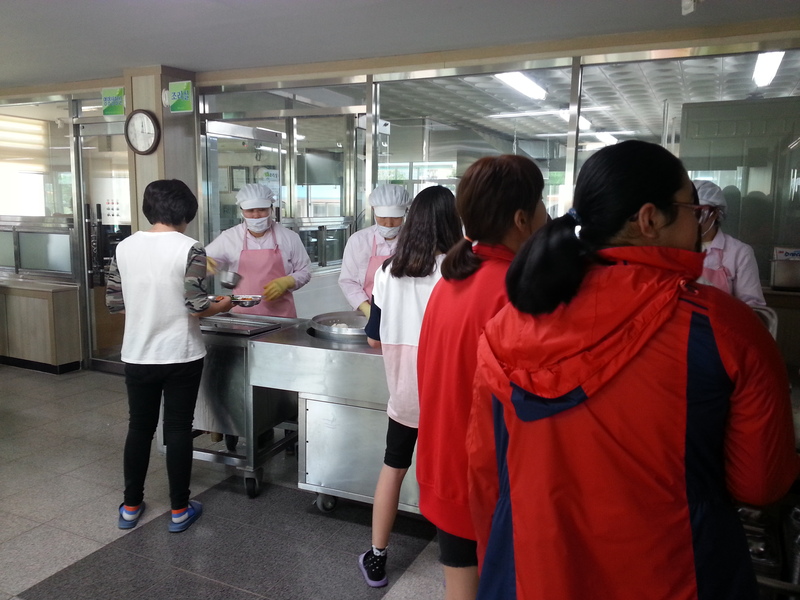 I’ve had a few different experiences in terms of how much the staff help out, however. 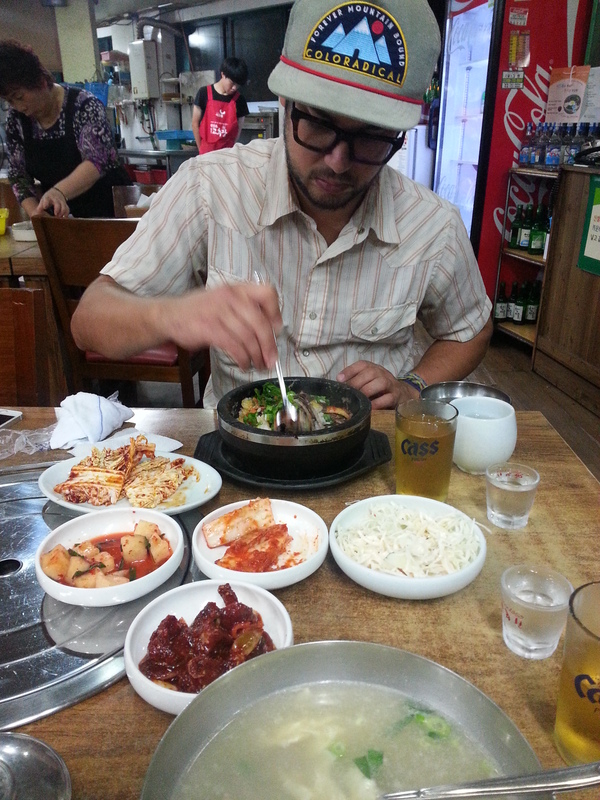 The first time David came to visit I was so excited to share a traditional Korean barbecue meal with him, but we were both disappointed when the woman working there wouldn’t leave our table. 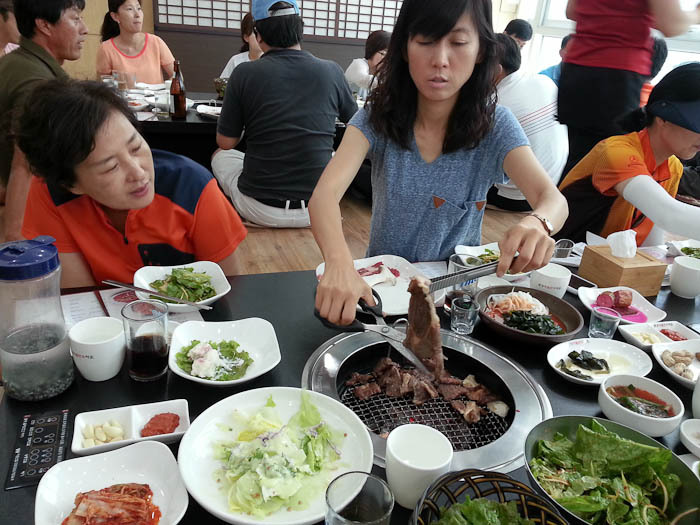 She just stood there, manning the grill until all the meat was cooked (at the time I was still fairly new to Korea and didn’t know how to politely ask her to leave and let us grill our own meat). That is the only time I’ve had the staff babysit the grill like that, though. Most of the time they leave you to do it on your own, or they might step in and flip your meat over if they see you’ve left it too long on one side. Either way, if you feel like you do need help or a refill of some sort, you can call the staff over by simply pushing a button at your table. I suppose some people might not enjoy the aspect of cooking your own food at a restaurant. Isn’t not having to do the cooking the point of going out for dinner? For some, maybe. I happen to love the communal, interactive dining experience, and the fact that I don’t have to wash any of the dishes afterwards makes it even better. 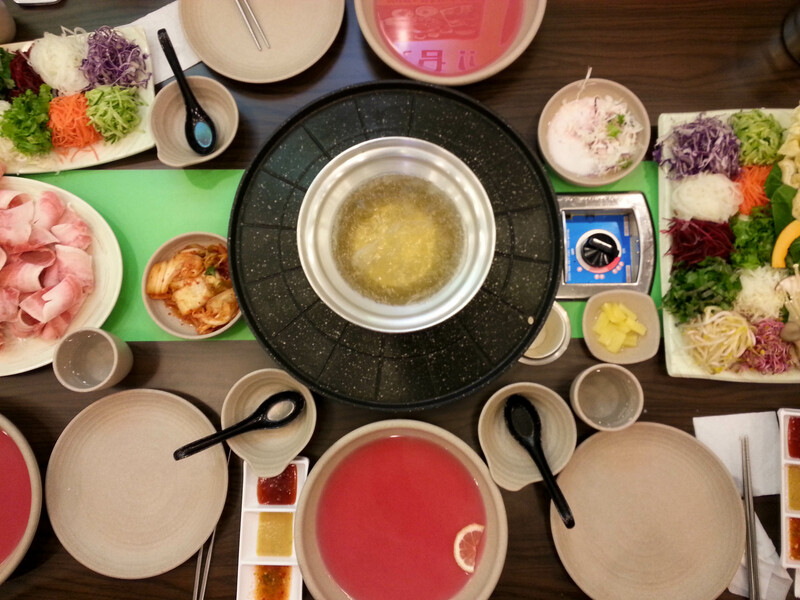 A Korean barbecue experience with samgyeopsal. 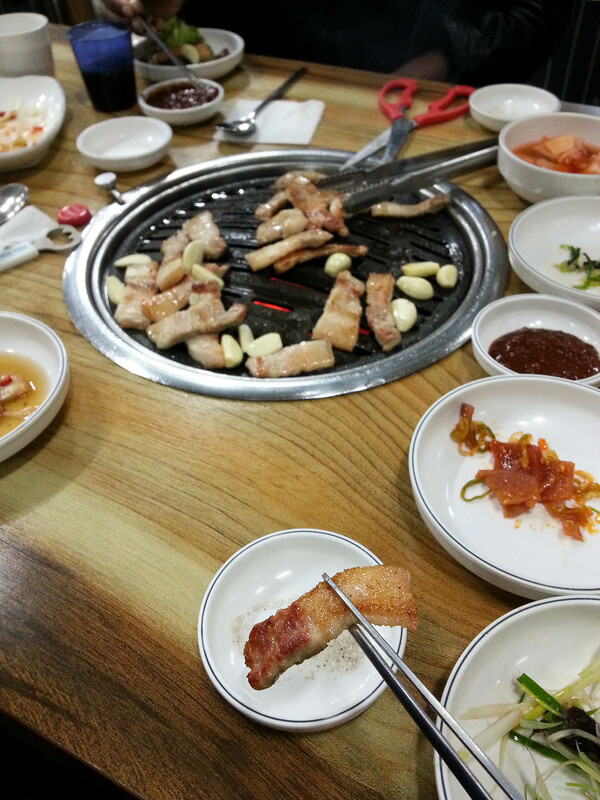 When ordering samgyeopsal, it’s served raw for you took cook on the grill at your table. 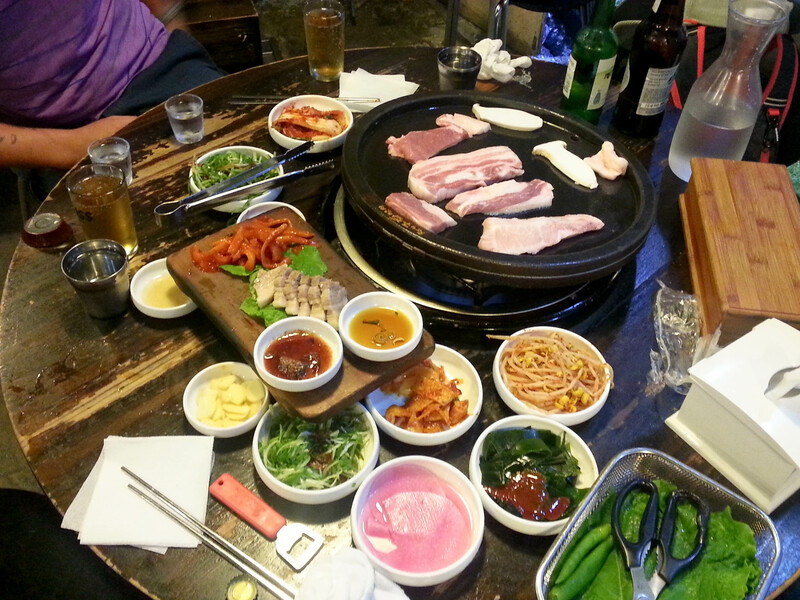 This not a picture of samgyeopsal, it’s beef, but it’s cooked and consumed in the same way samgyeopsal is. Notice she’s using scissors to cut the meat. Scissors are knives in Korea. 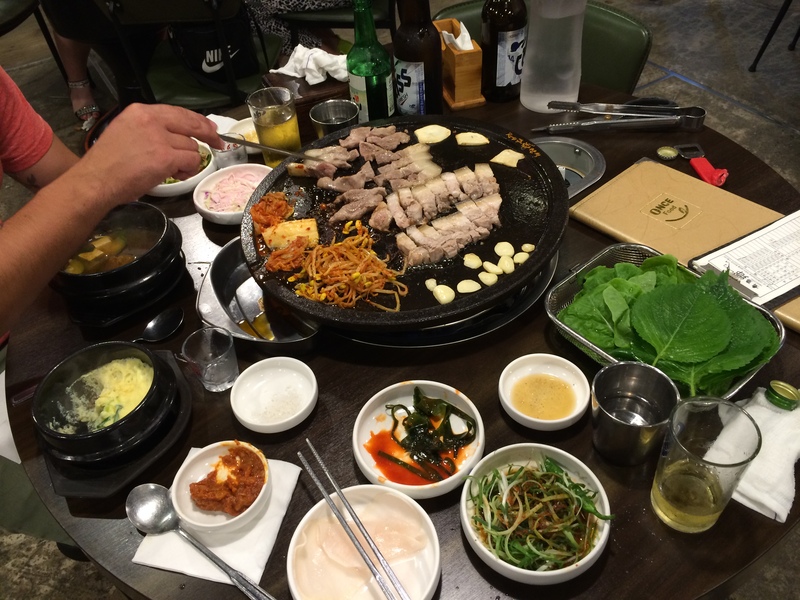 Korean barbecue typically goes hand in hand with soju and beer. Soju is a distilled, vodka-like liquor that is usually made from rice, and a 375ml bottle only costs $1-3. A perfectly crisp piece of samgyeopsal. 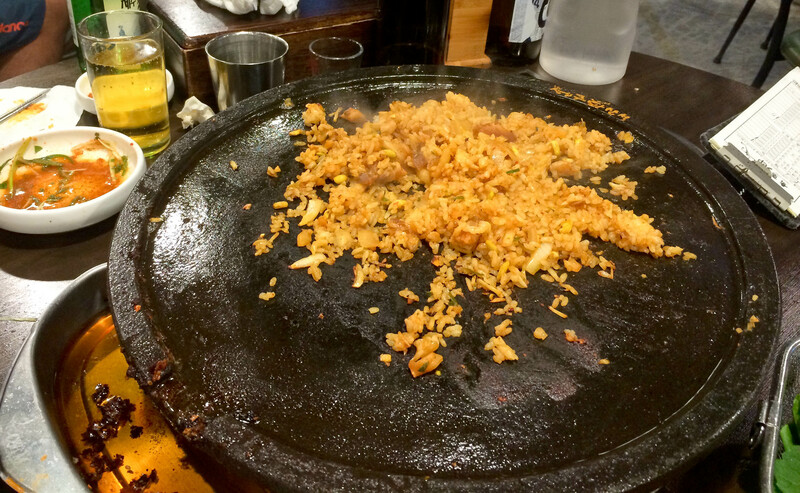 Depending on the type of grill at the restaurant, you can order rice to be fried up with the leftover bits and pieces of meat, kimchi and garlic. It’s so good! 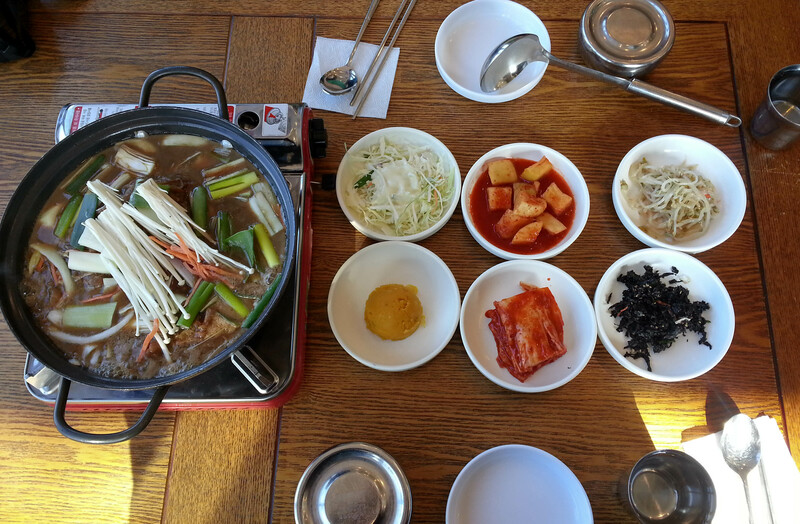 Shabu Shabu is not a traditional Korean dish, it’s Japanese. 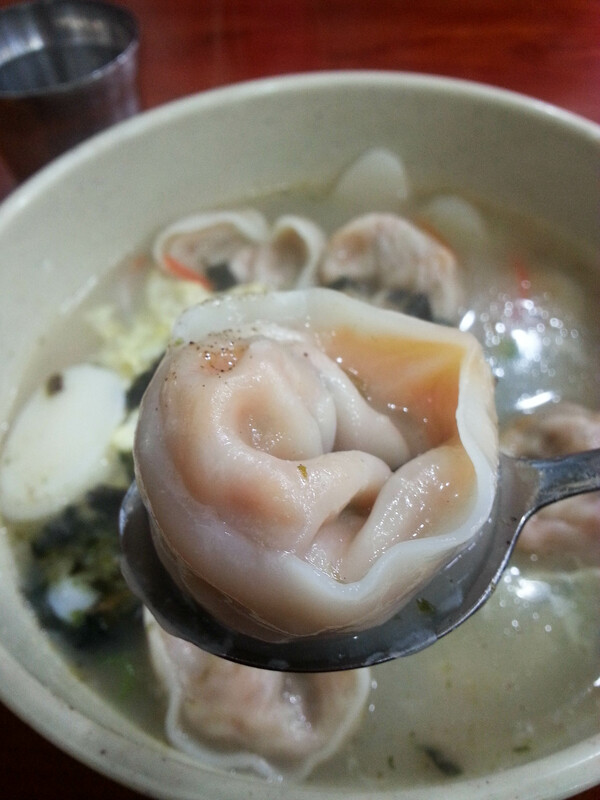 Actually, the idea originates from Chinese hot pot dishes, but it is very popular in Korea (not to mention delicious and healthy), so I had to share. 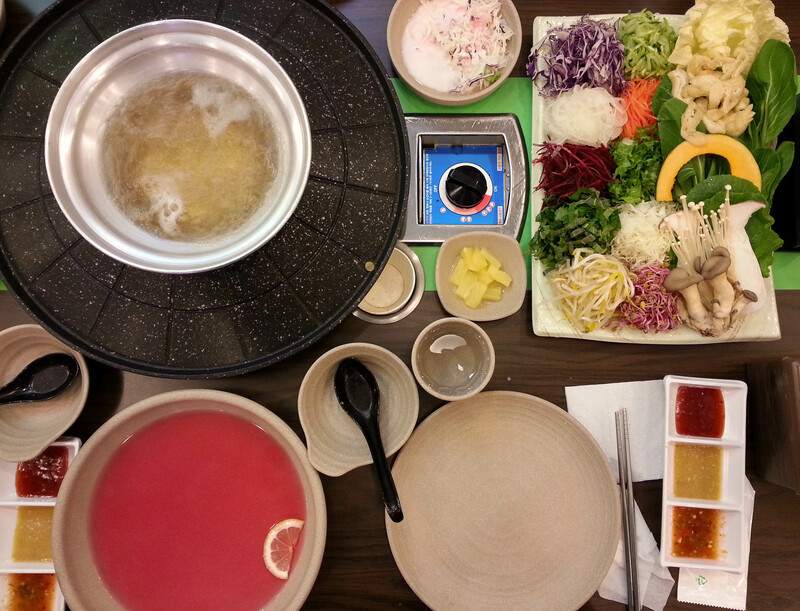 There are various kinds of shabu shabu, but what you will always find at these restaurants is a pot of boiling stock in the middle of your table, to which you’ll add an array of vegetables and then cook your meat in it. Sometimes there is also a grill along the outside of the pot for cooking meat, and at Vietnamese style shabu shabu restaurants you’ll find rice paper on the table to wrap up your meat and vegetables and then dip in various sauces. 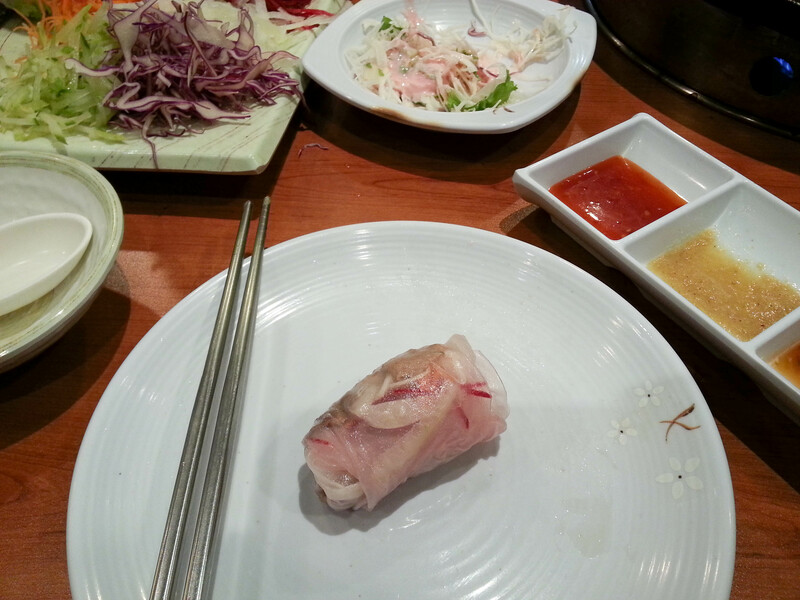 The important thing to remember when going to a shabu shabu restaurant is you must bring a big appetite because you will eat a lot (the first time I experienced this meal I could barely walk home, I was that full). This is because there are several “courses” involved, and it’s hard to stop eating when it tastes so good. 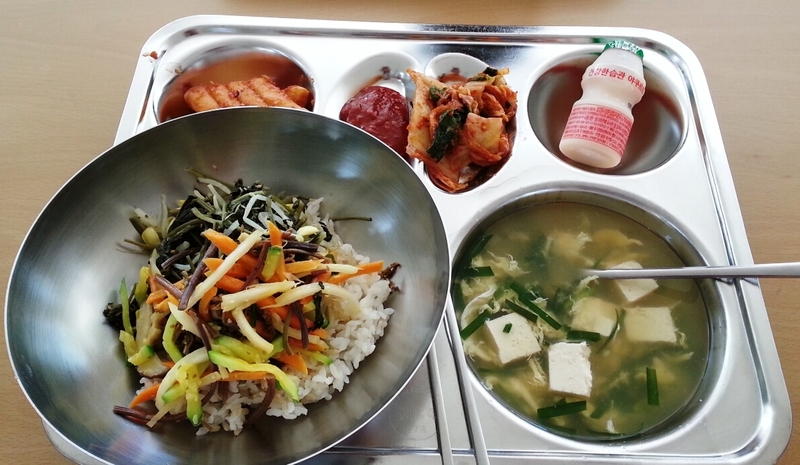 You begin by choosing a set of meat which will automatically come with loads of vegetables, plus noodles and rice. 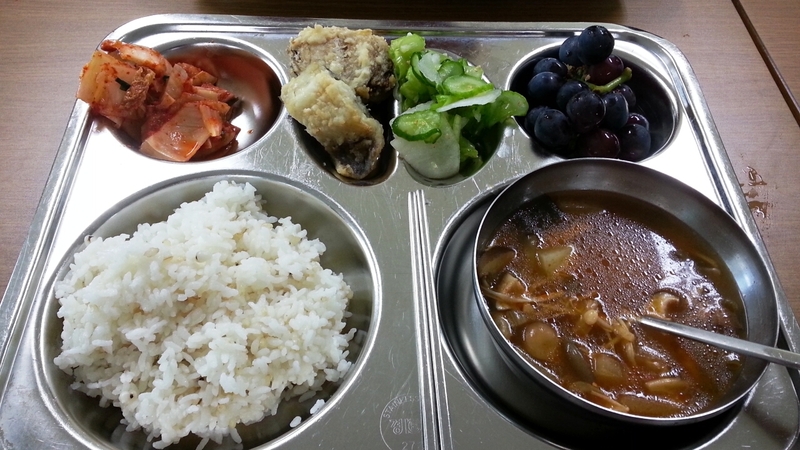 You’ll also get a variety of traditional Korean side dishes (called banchan). Originally, this dish was made with thinly sliced beef, which you only need to briefly dip in the stock to cook, but you will also see pork, duck, and seafood listed as options in meat sets. One of the things I love about this meal is how beautiful it is, especially right when they begin arranging all the dishes on your table. 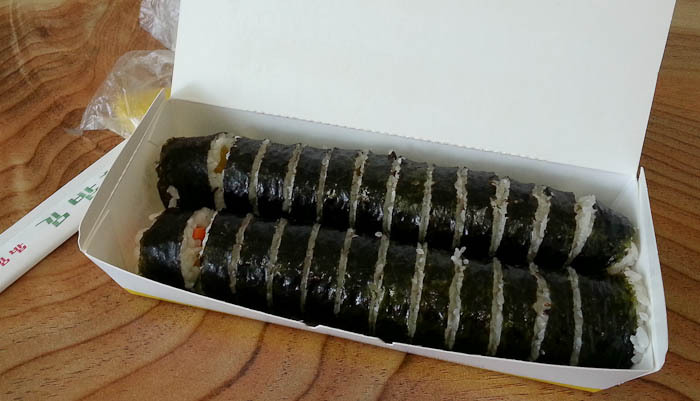 I tried to capture it on camera, but I found that a little hard to do because I was so distracted by the deliciousness. The colorful spread of vegetables. 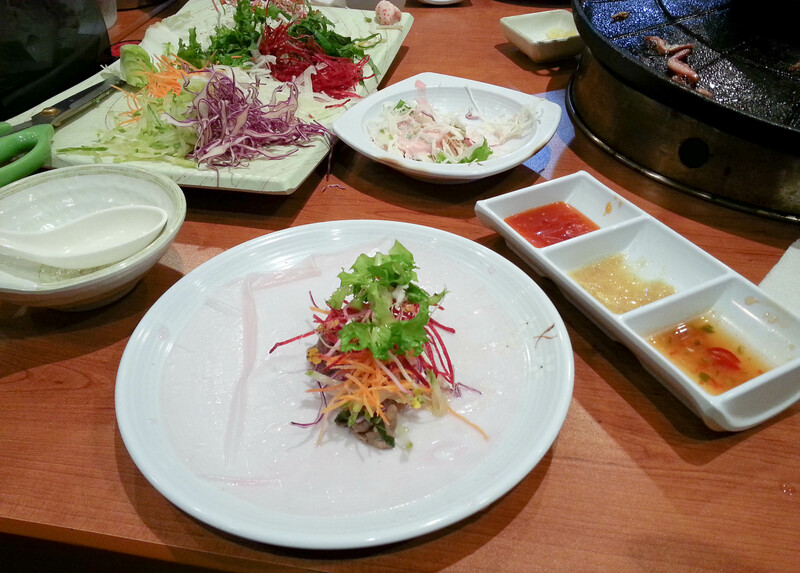 The pink water is for softening the rice paper (I have yet to find out what they put in the water to make it pink). 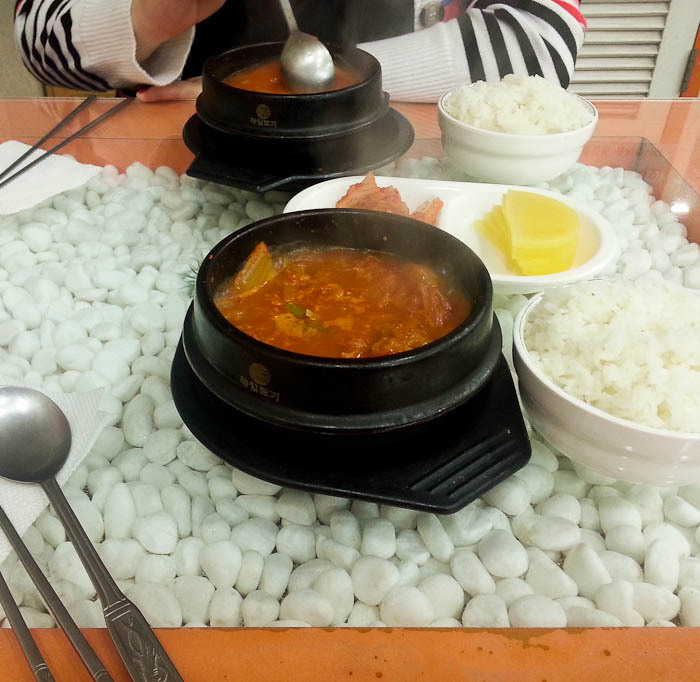 You can also see the meat set we ordered at this restaurant which is thinly sliced pork and beef. 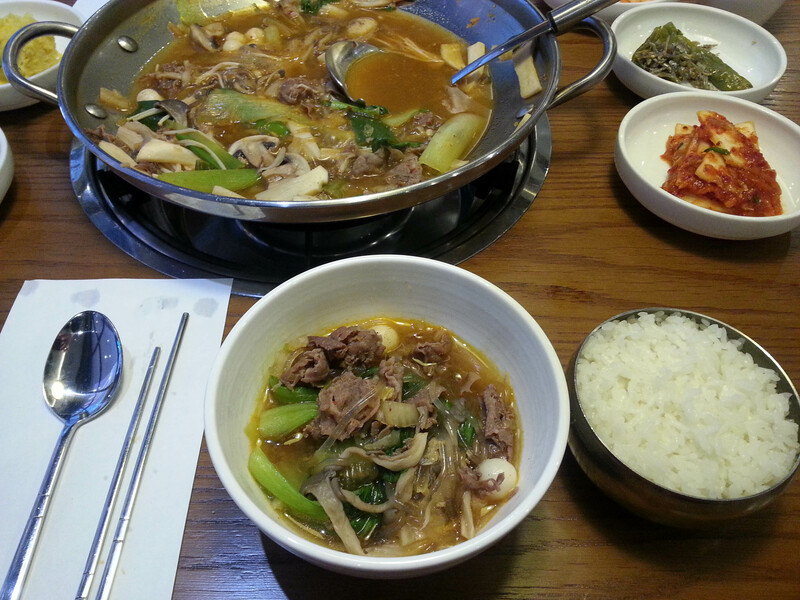 On another occasion, we chose thinly sliced beef and duck. 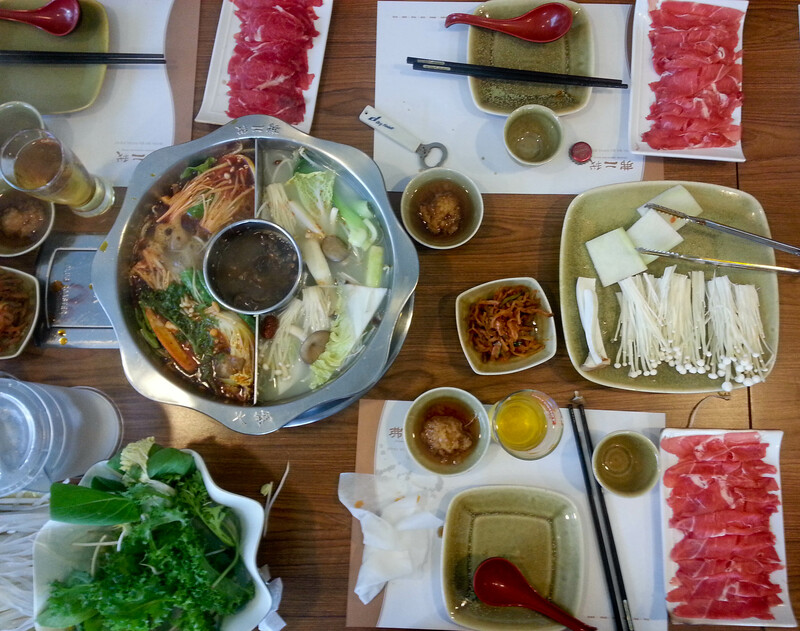 This is a Chinese version of shabu shabu. 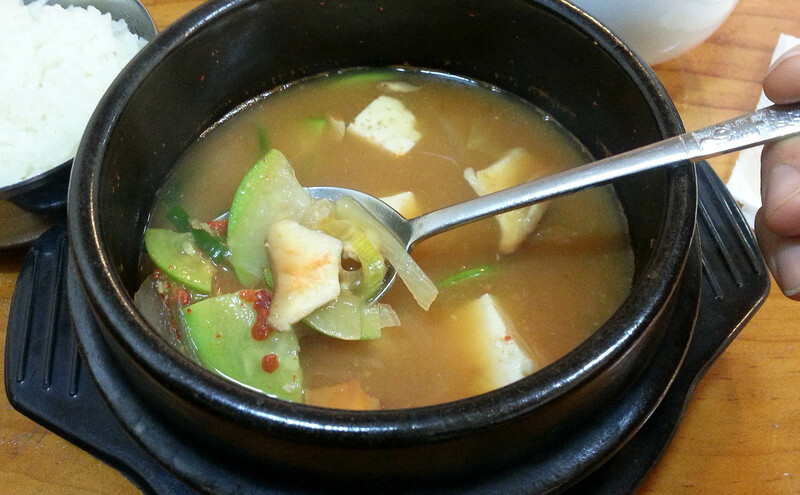 We had two different broths at this restaurant, one of which was really spicy. 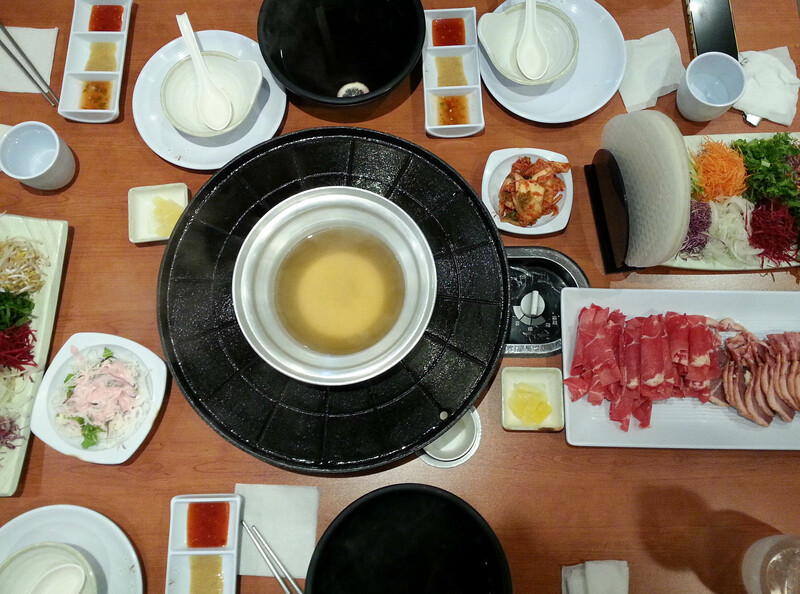 The name shabu shabu is said to be an onomatopoeia for the sound the meat makes when being cooked in the broth. 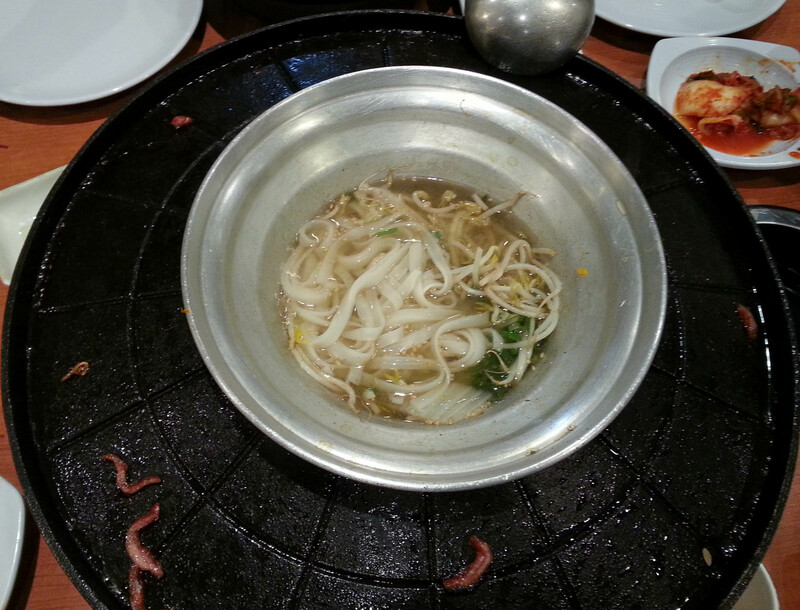 Here we cooked the duck on the grill and the thinly sliced beef in the pot. 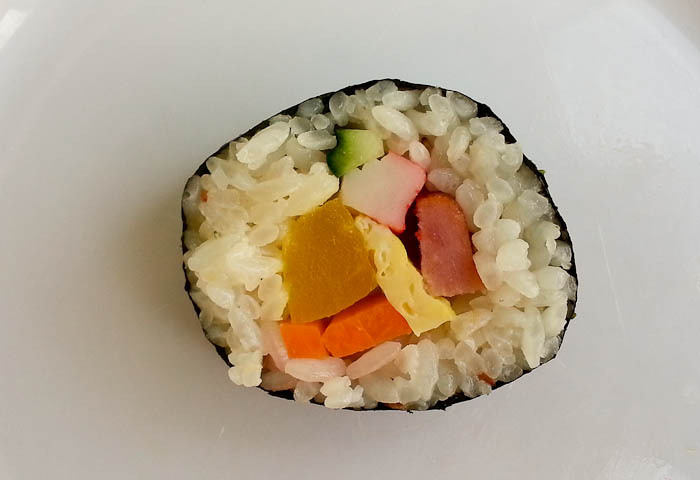 After dipping this rice paper in warm water to soften it, you pile on some meat and vegetables of your choosing. Then you wrap it up and dip it into one of the sauces. So good! 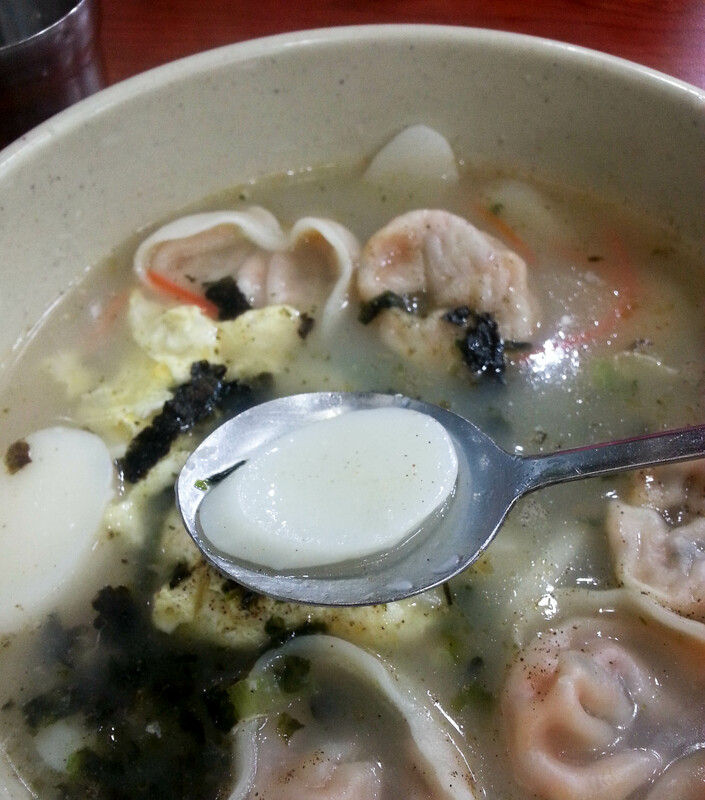 After you finish the meat, you add noodles to the remaining broth and enjoy some noodle soup. Finally, you add rice and an egg to soak up the last of the broth. 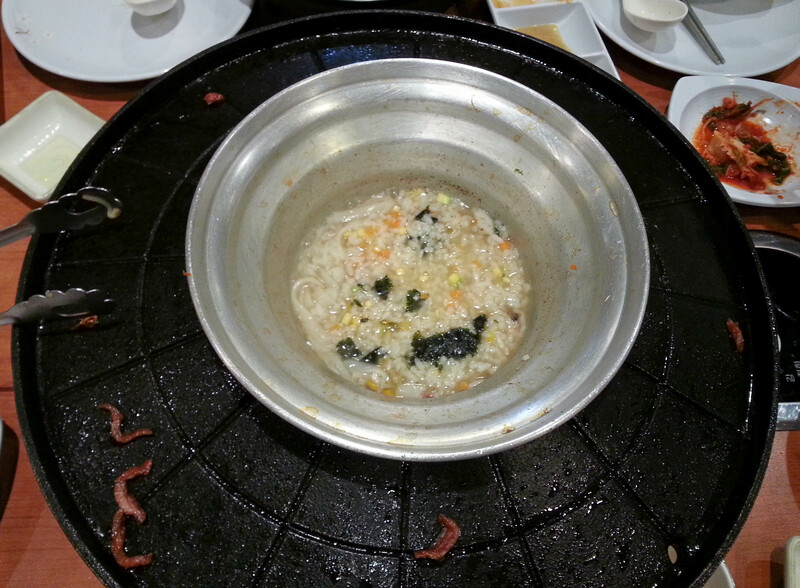 Now you are extremely full. Ready to do it all over again? 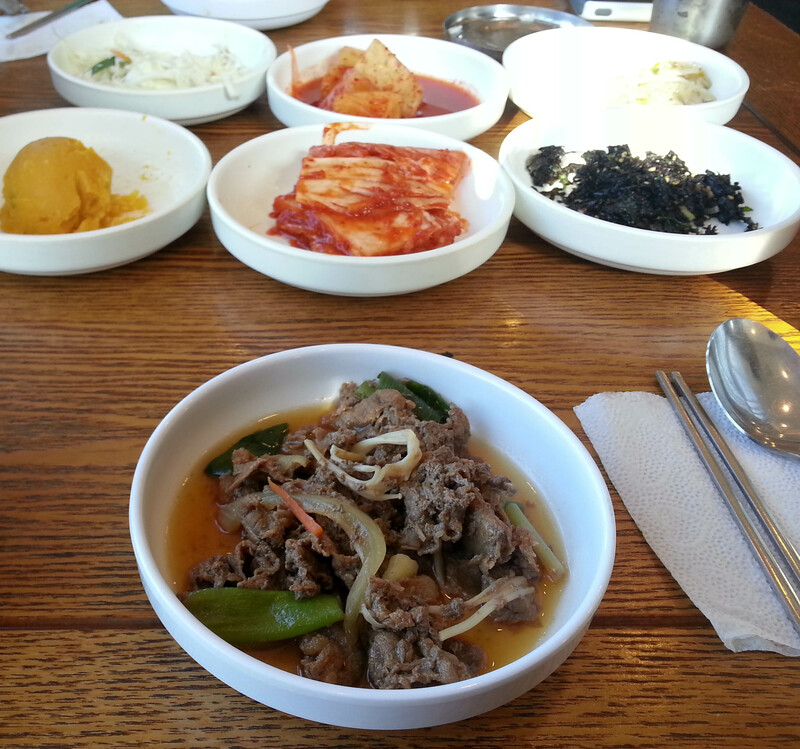 This healthy Korean dish is another one of my favorites so far, and I haven’t even tried it in its originating city yet. 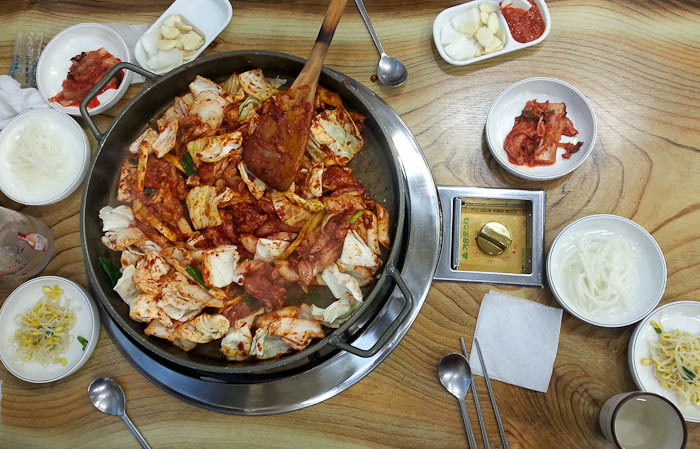 Dak galbi, which translates to chicken ribs despite the fact that chicken thigh or breast is usually used, is a specialty of Chuncheon in Gangwon Province. 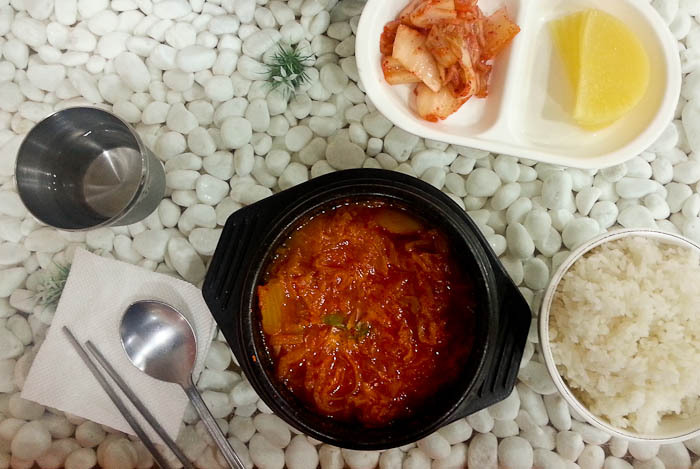 It consists of marinated diced chicken cooked in gochujang (hot pepper paste) along with green onions, sweet potato, cabbage, and tteok (rice cake). It’s quit spicy (surprise!) but oh-so-flavorful. 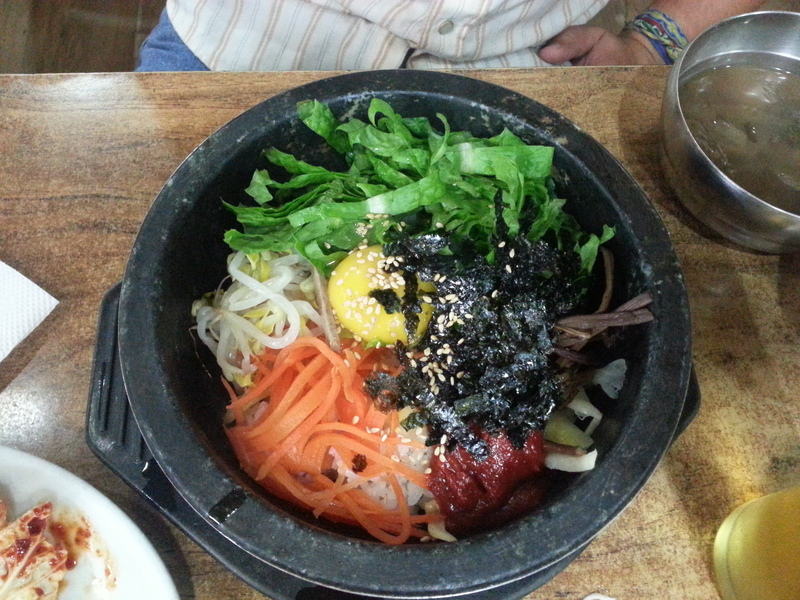 Like many Korean dishes, it’s cooked at your table and is meant to be shared. 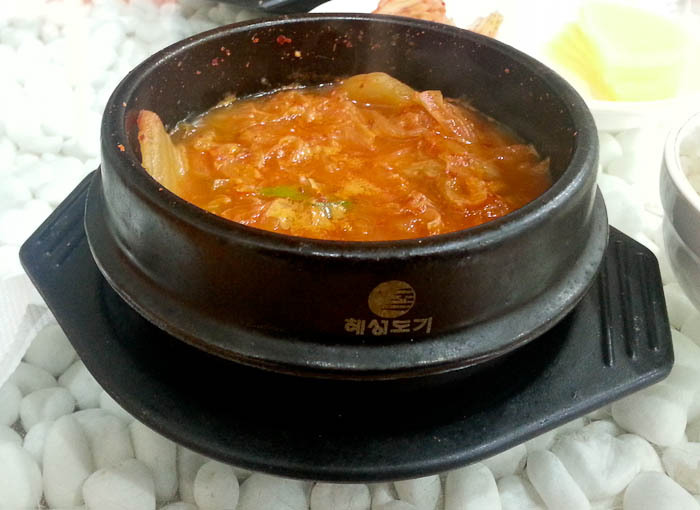 Oftentimes dak galbi is served with leaves of lettuce as well as ice cold bowls of pickled radish for when the heat really gets to you. 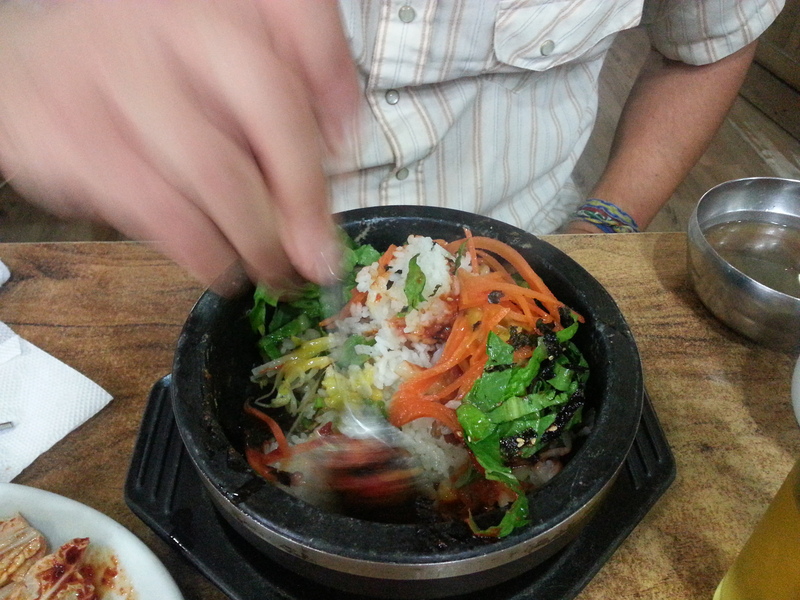 Dak galbi at a restaurant in Eumseong, served with kimchi, seasoned mung bean sprouts, onions, garlic and pickled radish. I love that you you get to enjoy the smell and site of it cooking AND get to skip out on all the prep work and clean up.